I bought this random skein of yarn at Hobby Lobby and I wasnt quite sure about the color. It was an eye-catching colorway but once I got home all I could think is "what on earth am I going to make with this?" Hobby Lobby tends to carry really interesting prints and this one "Sunrise Sky" popped out at me. 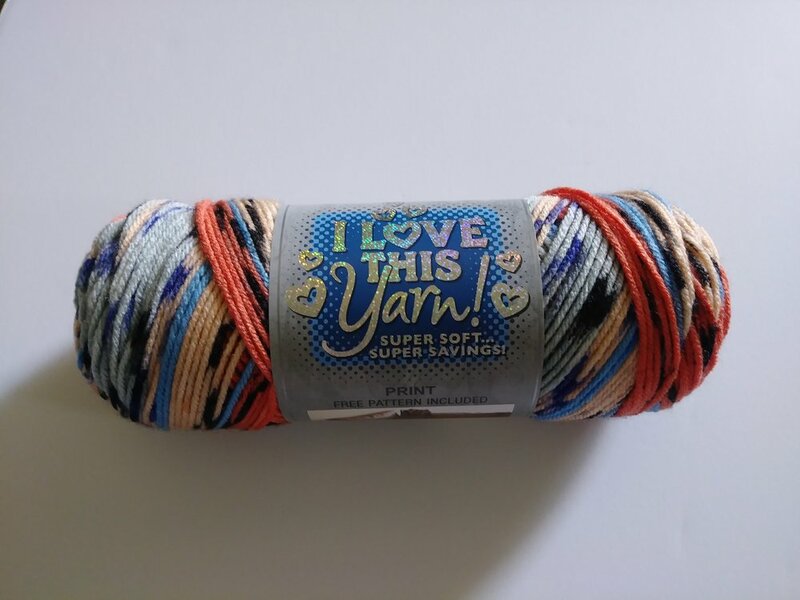 Its all too familiar that us yarn crafters buy some variegated yarn only to hate the way the colors look once its worked out, but since this was a "print" instead of variegated I figured I had a little wiggle room. 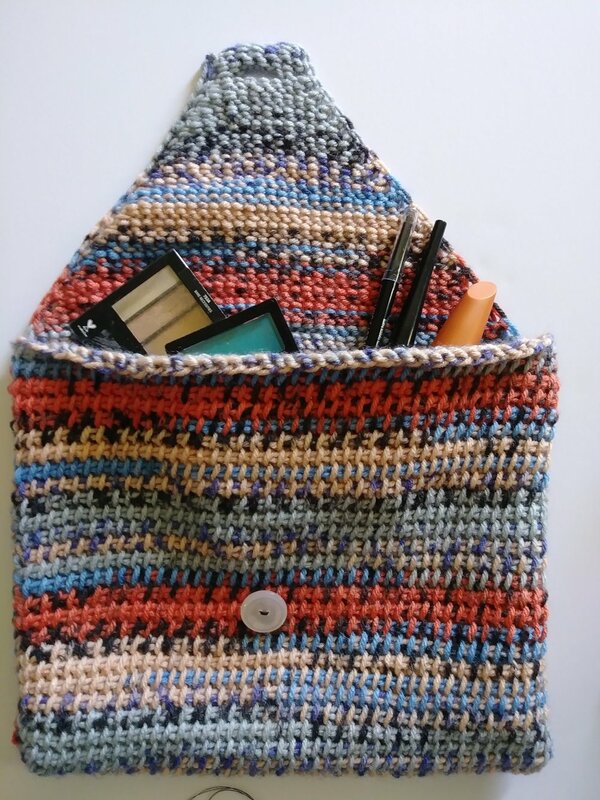 Fast foward about a month later I'm still staring at this yarn on my project covered desk then I remembered that I really needed a new makeup bag since mine was overflowing and this is what I came up with! I decided to work this in Tunisian Simple Stitch (TSS) since it creates a dense fabric which is perfect to keep those eyeliners from poking through. This pattern is a great beginner's Tunisian Crochet project and a fabulous one-skein project for that random skein you know you have stashed away. 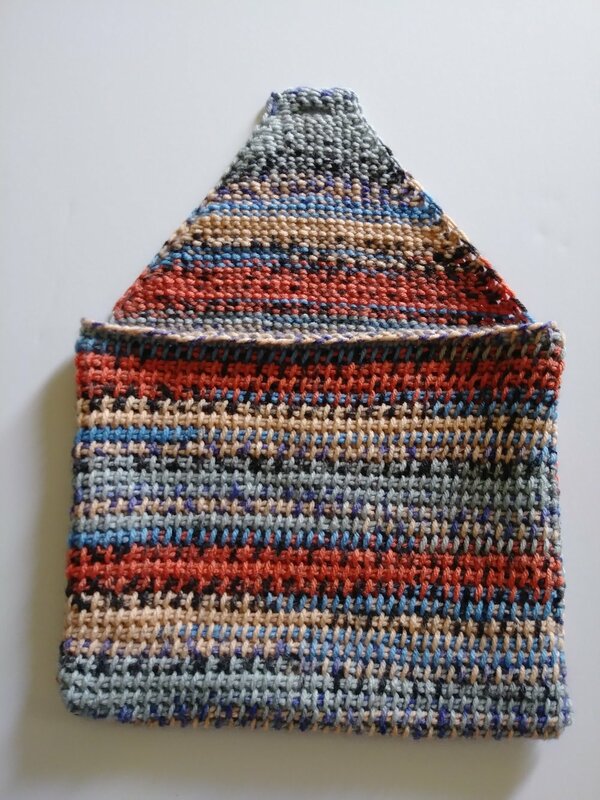 Tunisian Simple Stitch- TSS : Insert hook, from right to left into front vertical bar of next stitch, pull up a loop. Row 1: Fwd: Insert hook and pull up a lp in 2nd ch from hook and each ch across. Rtn: Ch 1, (yo, pull through 2 lps on hook) across. Row 2: Fwd: TSS across. Rtn: ch 1, (yo, pull through 2 lps on hook) across. Row 56: Fwd: Insert hook in next 2 bars, draw up a lp (decrease made) TSS across to last 2 bars, insert hook in last 2 bars, pull up a lp. Rtn: ch 1, (yo, pull through 2 lps on hook) across. Rep row 56 until 11 stitches remain. Buttonhole: Fwd: Insert hook in 2 bars, pull up a lp, TSS, yo 3 times (counts as ch-3 sp), sk 3 sts, TSS, insert hook in 2 bars pull up a lp, TSS in last st. Rtn: Ch 1, (yo, pull through 2 lps) across. Fwd: TSS to ch-3 sp, (insert hook in ch-3 sp, pull up a lp) 3 times, TSS across. Rtn: ch 1, ( yo, pull through 2 lps) across. Sl st in each vertical bar across. Be sure to block before assembly to prevent curling at the top and bottom edge. Fold flap over to find the button placement, then sew button in place. Please let me know what you think and I would love to see your finished project!